Stephanie is originally from Monroe, WI. She moved from Milwaukee to Madison after finishing school to be closer to friends and family. She has worked in the service industry for almost ten years. “I started my first serving job at a small diner in my home town the summer before college. I enjoyed the fast paced environment and interacting with guests and coworkers. In college, I found a couple other serving jobs and worked the front desk at a hotel. Since then, hospitality is something that I have become passionate about. I’ve worked in several different styles of restaurants including corporate franchises, small family businesses, fine dining, etc. 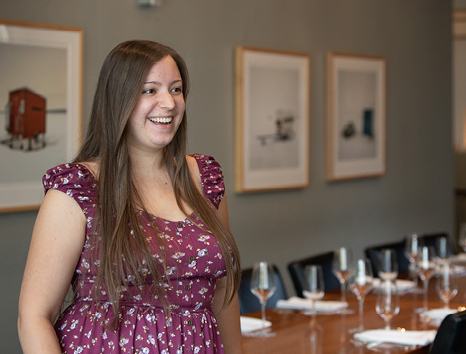 ” Stephanie likes working with restaurant people because she says they are often outgoing and easy to relate to. She says that working in high volume and stressful situations helps you to grow closer to your coworkers and build a family-like relationship. “I've always enjoyed working with people because I love taking care of others and staying busy and engaged. The restaurant industry has a sort of controlled chaos that I find stimulating and addicting. When guests rave about the quality of the food and service, especially after a busy shift, I receive a sense of satisfaction that is difficult to rival.” In her free time Stephanie enjoys hiking, camping, playing pool, trivia, reading, going out dancing and cuddling with her cat. She also enjoys spending time with family and friends.